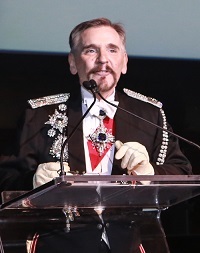 One of the grandest moments at any Night of a Thousand Gowns comes when His Royal Highness, the Grand Duke Swanson opens the curtains on the glittering assemblage of monarchs and courtiers of the Imperial Court of New York. It’s a showstopping moment of huge gowns, huge jewels and it’s also the moment that the members step up to play the most regal and most ridiculous part of this game we play: protocol. 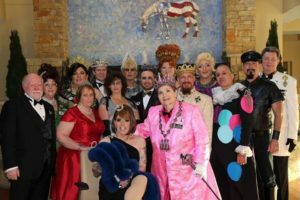 Part of what makes the Imperial Court of New York different from other fundraisers in New York is our attention to formalized whimsy. Whimsy because we’re a bunch of grown men and women who work day jobs, pay mortgages and insurance bills, and worry when their pets have to go to the vet. We’re not actually Grand Duchesses and Earls, running around like we actually run Downton Abbey, but it’s a game we play and nowhere is it grander than at the ball. First: a note on titles, as they pertain to the Imperial Court of New York. (Other courts have their own sets of rules, most variations on the themes, and much of it based on British nobility, as does ICNY.) 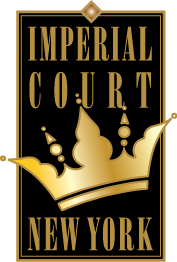 When you join the Imperial Court of New York, you do so as a lord or as a lady. That choice is completely up to you and may have nothing to do with the way you present to the world at large. 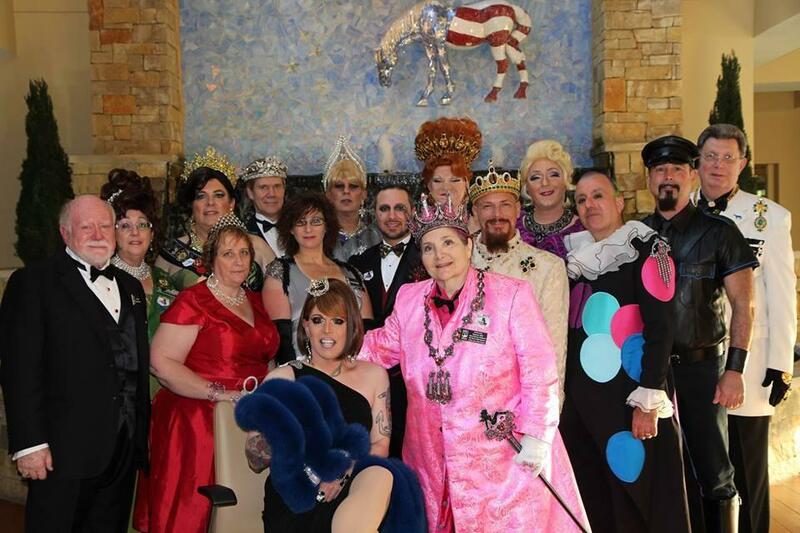 Our members work for the organization by volunteering at fundraising shows, working on committees to produce Night of a Thousand Gowns, perform in the community and help the monarchs in a myriad of other ways. After a year as a member, one is immediately elevated to Baron or Baroness. Empress Gracie Steeles and Emperor Wen-D Bouvier Pinkhouse with ICNY in Kentucky following their presentation. After you meet certain organizational and temporal requirements, you may choose to run for Emperor or Empress. 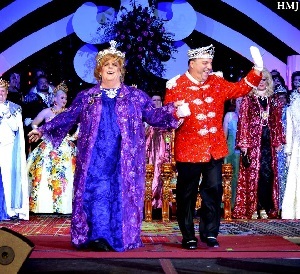 The winner of that elected office is immediately invested as Imperial Crown Prince Royal or Imperial Crown Princess Royale, titles they will hold for approximately six months until their coronation at the next Night of a Thousand Gowns, where they will be crowned Emperor or Empress. Wait. What happened to kings and queens? Look around. There are already innumerable queens, ain’t nothing special about THAT title, Maybelle. In any case, in New York, once you’re elevated to a certain ranked title, you hold it for as long as you remain a member of ICNY: it has nothing to do with the particular reign, or the number of years you’ve been a member, but with the size of your heart. Secondly: What do you DO with those titles? Firstly, these titles denote the Order of Precedence, i.e., the order in which you walk into a room, or are presented to the monarchs. And, until you’re elected Emperor or Empress, you bow and curtsy. A lot. At least, that’s the idea of the game. When you meet a crowned monarch for the first time in an evening, one ought to greet them with “your Majesty.” After that, “Sir” or “Ma’am” is acceptable, as it is in the Court of St. James‘s. This is part of the game of playing royalty, but is also a sign of respect: Emperors and Empresses have earned those titles. Some may be reigning, others may have reigned decades ago, but all are servants of their community. So when those curtains open at Night of a Thousand Gowns, and you start to hear titles being thrown down the runway toward our Emperor and Empress, we hope you understand a little of what they mean and how they’re organized. COME BE SILLY WITH US, FORMALLY!